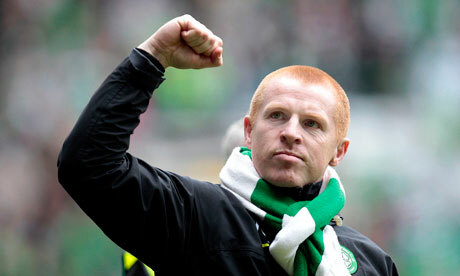 Is there a greater sight in football? 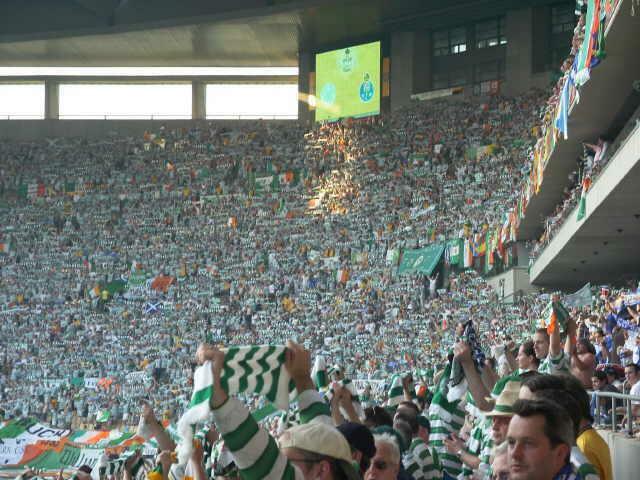 Thousands of Celtic scarves held aloft as ‘You’ll Never Walk Alone’ rings out in football grounds at home and abroad. 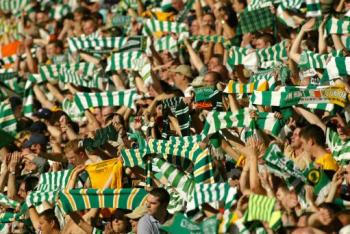 For some Celtic supporters the scarf is a cherished item, sometimes passed down from parents or older relatives, and looked after with care. 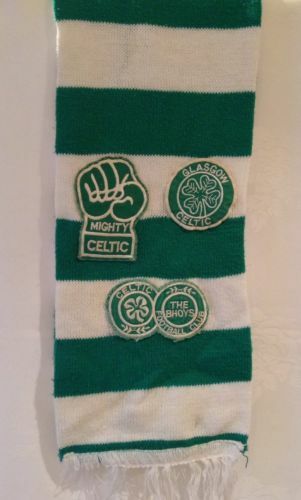 For others it’s something bought without much thought on the big European nights and soon discarded or simply used to keep the neck warm in the kind of weather we’re used to on the fringes of western Europe. But it means something. 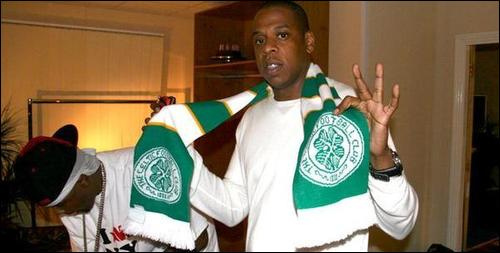 It’s a public statement – it declares to the world “I’m a Celtic supporter.” And it’s a statement that Celtic fans have been making for decades. 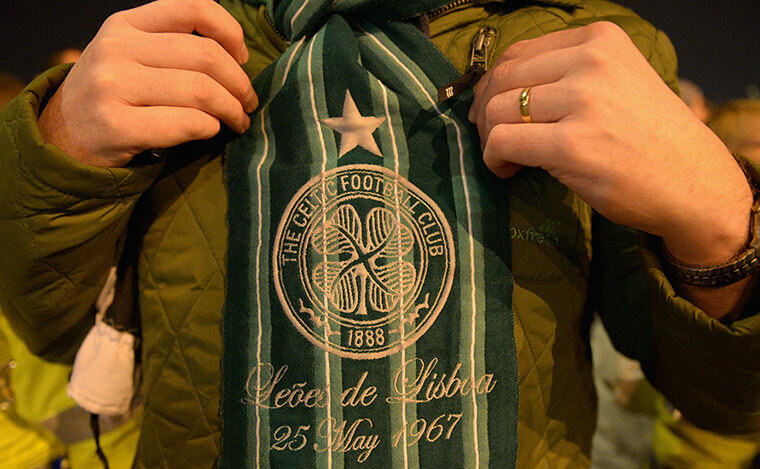 Some of the surviving photos of the Celtic brake clubs show that scarves have been a feature of the support for almost a century. 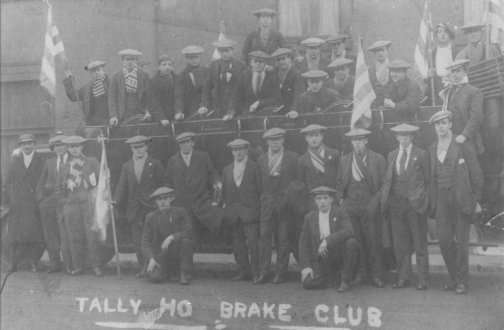 Here are the bhoys (and they’re all bhoys) from the Tally Ho Brake Club, believed to have been based in Hamilton, in the 1930s and 1940. Wearing suits and bunnets (and gigantic bunnets at that!) 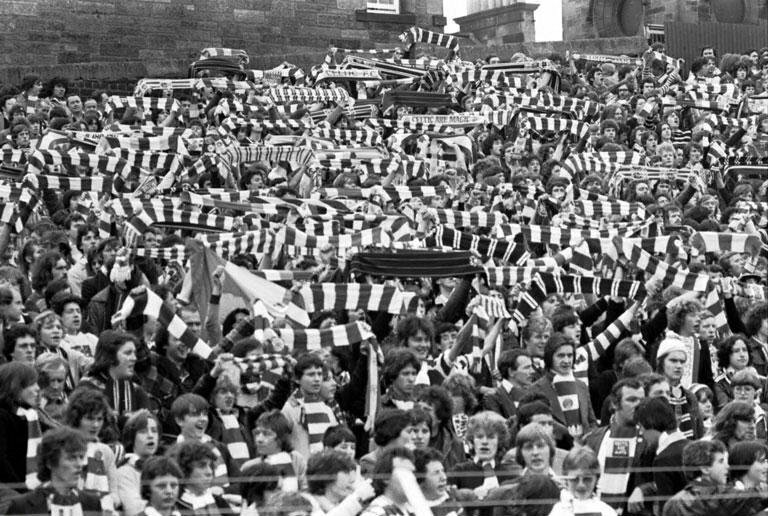 was the height of fashion for football fans at the time but you can clearly see some home-made scarves making an appearance here, jostling with flags, ties and badges for attention. 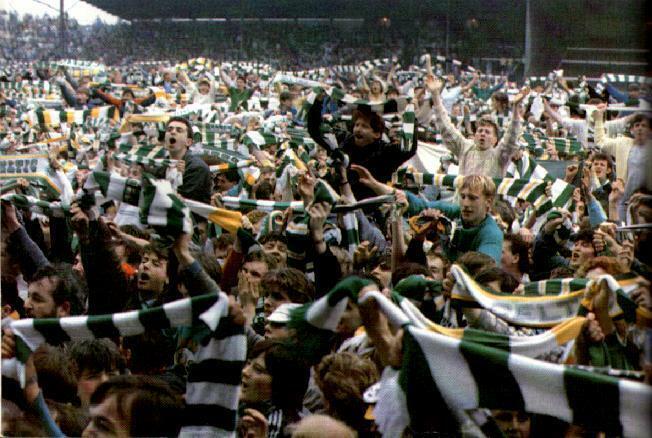 It was the 1960s before scarves really came into their own and started being produced in numbers rather than being knitted in front of the fire. 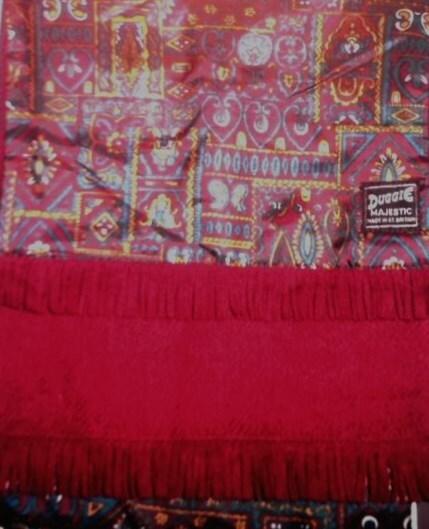 At the time the major youth fashion was Mod and a regular feature on that scene were vintage-looking scarves, often made by a company with the magnificent name of ‘Duggie Majestic’. 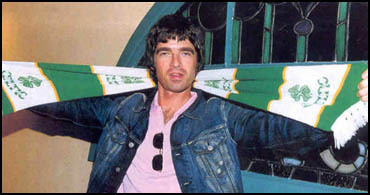 Their wool or silk scarves (like the one below) became big sellers and it is believed their success saw other producers branch out into football scarves. There was definitely a market for them. 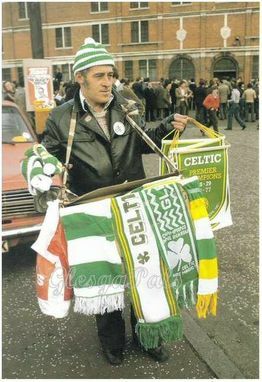 By this time supporters were keen to identify with their club colours and a varied range of designs were bought by Celtic fans of the day. 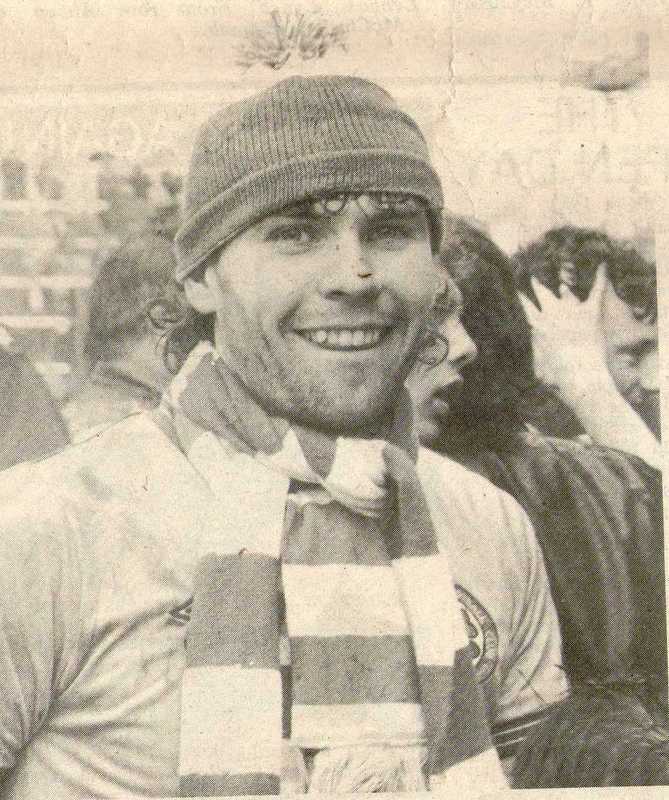 When Hibs captain Pat Stanton joined Celtic in the mid-1970s, he couldn’t believe that the Viewpark Bhoy carried his own scarf with him onto the team bus for away games. 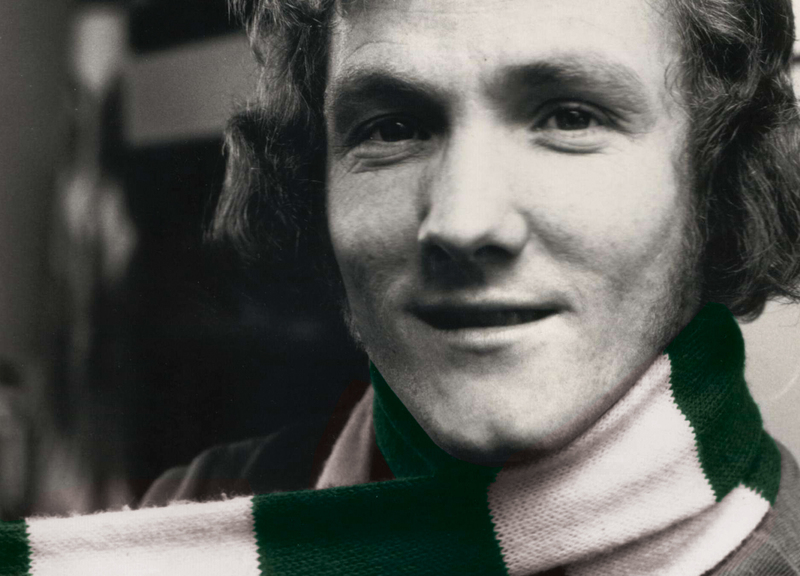 It was because Johnny was a Celtic fan himself and so dedicated to the cause that he is still fondly remembered among his fellow supporters today. 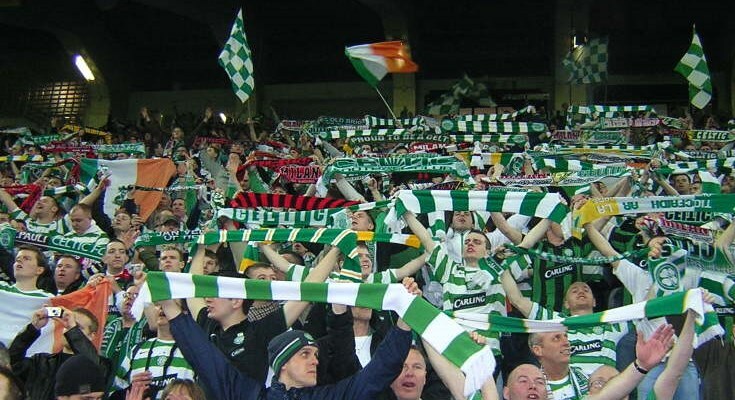 It is hard to envisage a time when scarves won’t be worn by the Faithful, given how enduring they have proved down the decades despite the vicissitudes of fashion. 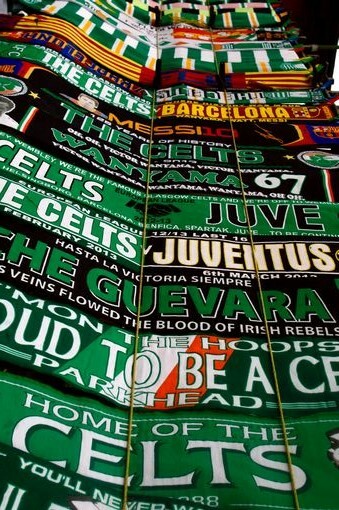 For many Celtic fans scarves appear to be a key aspect in their identity – especially at a time when virtually any message, colour or design can be placed on a scarf professionally so catering for virtually all tastes. 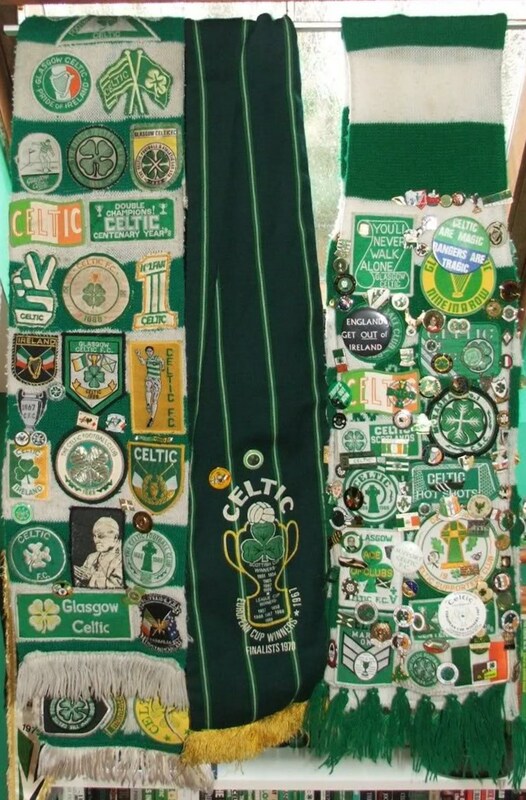 We’d love to see a photo of your own Celtic scarf – and if there’s a story to it, or anything about it you consider special, even better. We’ll collate them online for publishing here. 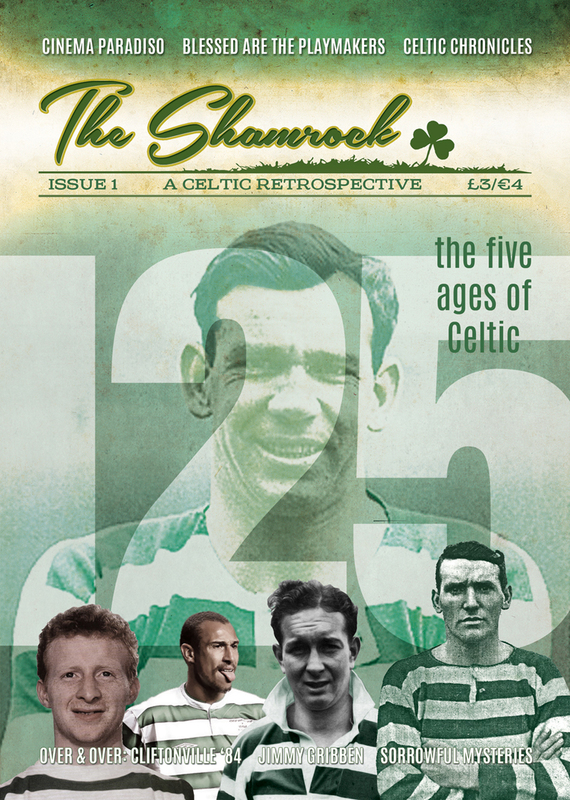 Email your pictures to: theshamrock@outlook.com or share using Twitter (TheShamrock@CelticRetro) or Facebook (www.facebook.com/TheShamrockGlasgow). 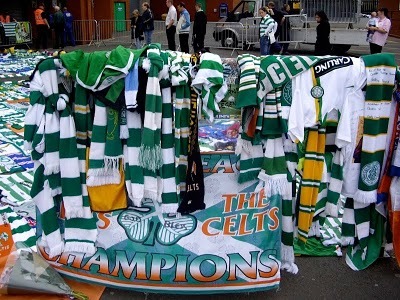 great to see all the old scarves , but one is missing (I,m sure I still have it somewhere in the attic) ….it was the a short kinda scarf with angled pointed ends (it would probably be classed as a cravat nowadays) it was a good quality so was probably sold by celtic themselves .I wore it for many years and was rather surprised it was not shown on the memorabilia of scarves . 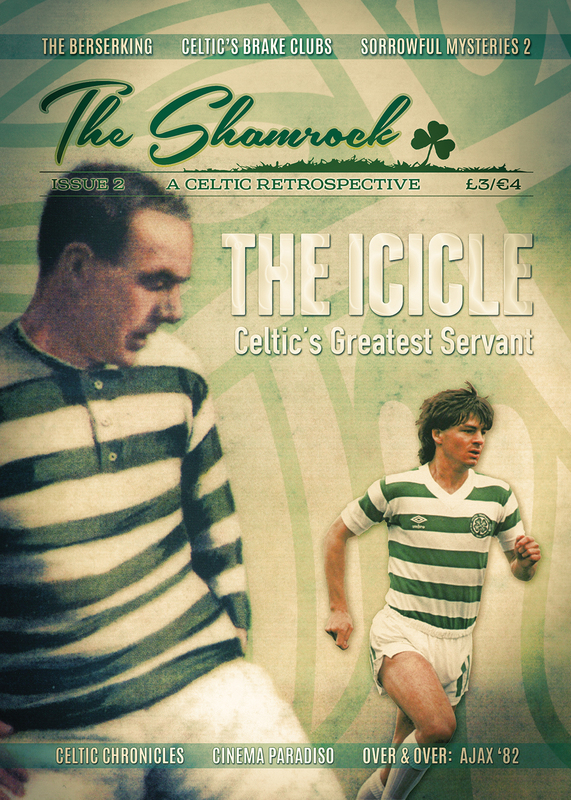 Totally correct about the difference in marking the passing of Doyle and Burns.I phoned my mate to tell him about the passing of Doyle and he went to Celtic park with his friend at 11.30pm and were the only 2 there. 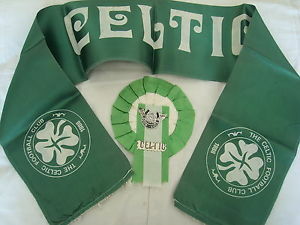 My late father mentioned a shop at Bridgeton Cross that sold football scarfs in the 1920/30s called Vernons??? 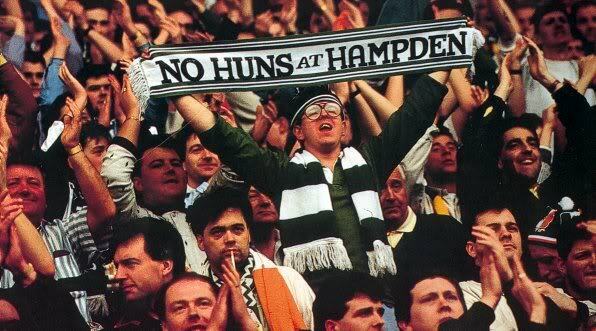 Think the shop was still there until the 1990s. 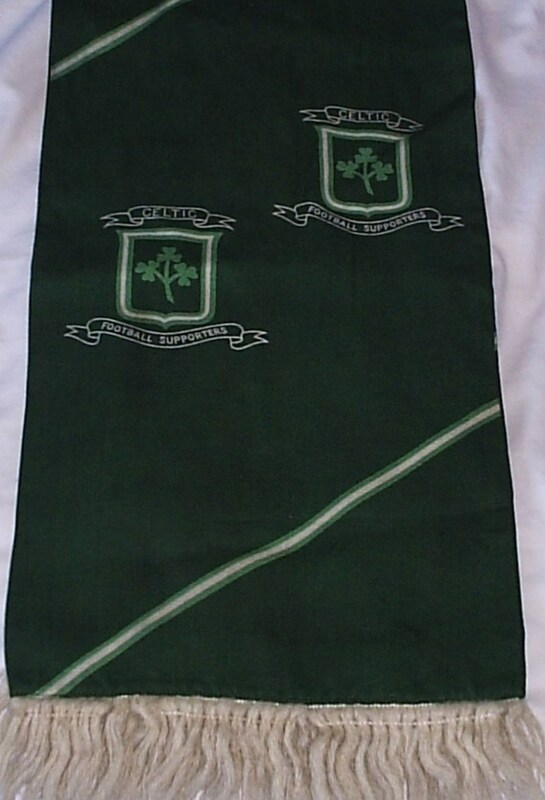 Another emblem of the time (1930s) was an emerald green handkerchief (hanky) showing from your breast pocket on your jacket. 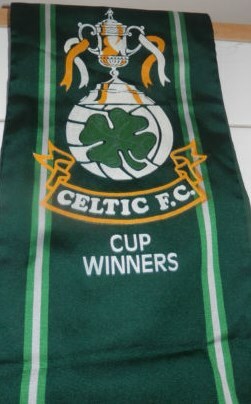 The first scarf i bought personally was the first one shown on here from an outfitter next to the Empire Bar on Saltmartket, it cost 12/6d (65p). 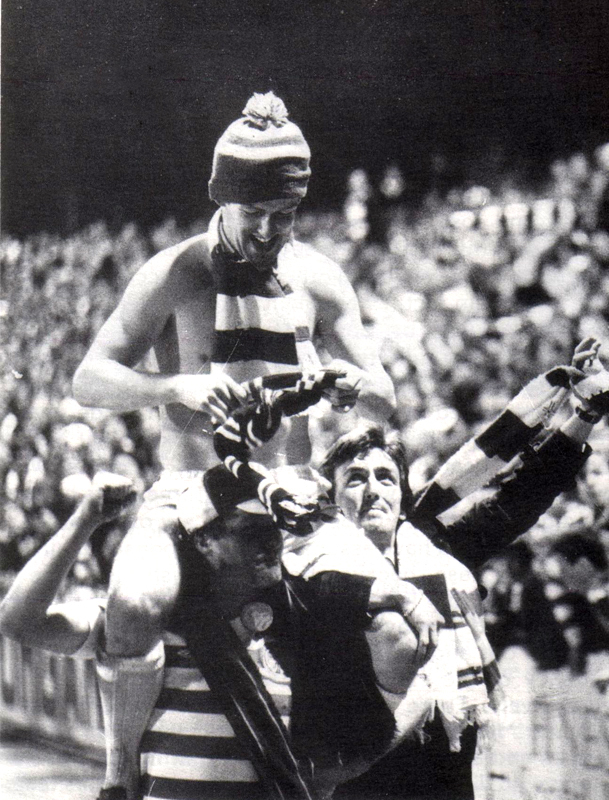 Bar scarfs were called Walk On scarfs in the 1970s. 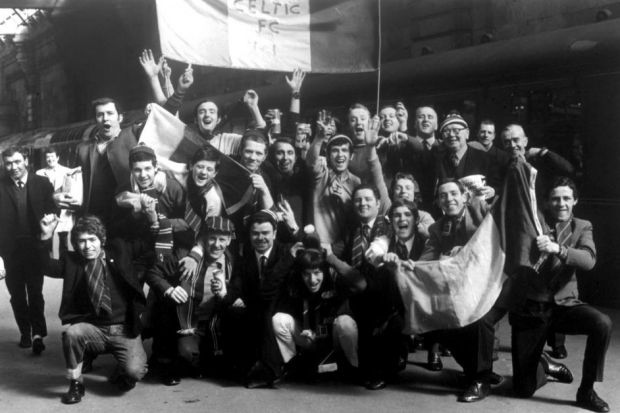 The first Celtic shop was in the supporters hall on Kinloch St right beside the present day away end.